With subdued interest, I recently took note of an area legal case in which a young man pursuing a medical education was convicted of murdering his wife, a young medical professional, by slashing her throat. His only defense, which didn't go over well in court, dictated that he was certain the person he killed was an imposter pretending to be his wife. The jury didn't buy it, and he's going away for a long, long time to a place housed by imposters aplenty. These little I-killed-a-pretender incidents seem to pop up with some regularity in the news and, of course, juries never accept the assertion, particularly when evidence indicates the involvement of mental illness in the defendant's actions. Certainly, it's one thing to say to one's spouse or partner, "You just don't seem like yourself today," and quite another to settle the matter with homicidal actions. How in the world does one ascend to that level? Where do delusions of identity take root and flourish into terror? What make us strangers to others? Is there indeed something about our existence causing us to appear different to those who think they know us? Does the fabric of reality occasionally flutter and bend in ways we can't comprehend? I'm not specifically referencing the UFO phenomenon, but we must admit that the UFO topic in itself advances the incredible. Stories about this latest murder trial reminded me of a bizarre incident from 1991, reported by the Associated Press, another circus of identification horror ending in death that went on for 16 agonizing hours in Genoa, NY. Alleged perpetrator Rolf Rahn (pictured, holding a gun) was eventually shot and killed by NY State Police. According to the AP, Rahn, 37, had called upon plumber Kevin St. John to repair a well on his property. At some point during the day an argument erupted and Rahn, calling St. John an "android," shot the plumber in the chest with a single gunshot. He then held St. John hostage in a barn for two hours until police negotiator David Gould arrived, when St. John somehow escaped and was rushed to a hospital in serious condition.. Then the weirdness factor escalated. "I thought I had him at one time," Gould stated. "Then he started talking about this space stuff. He thinks I'm Captain Kirk, I think." By that Saturday evening, dozens of state troopers had surrounded Rahn's farmhouse, with negotiators attempting unsuccessfully to defuse the situation by telephone. During the conversation, Rahn assured Gould he wouldn't be taken alive -- and demanded a spacecraft to take him away. "I told him it was broken down," advised Gould. In a phone conversation with a reporter from the Auburn (NY) Citizen, Rahn insisted he was an "alien" surrounded by "evil androids," and would not do anything until police sent a large flying saucer to rescue him. Unfortunately, as the long night progressed, Rahn was fatally shot when he pointed a handgun at officer Gould and refused to drop it. Now, I know that looks can deceive, but even one's family dog would admit that Rahn, as shown above, appeared, um, curious, to say the least. Chances are, the guy was so far off the deep end that retrieval would have been all but impossible. Still. . . Still, why aliens? Why androids? Why spacecraft and flying saucers? How did that stuff get into Rahn's extremely disturbing box of mental monsters? Time after time, UFO abductees whose fantastic stories seem plausible particularly because their mental status is rock-solid grade-A leave investigators truly puzzled. But then a berserker like Rahn pops up, posing a considerable threat to both lives and emotional credibility, and you just know the UFO debunkers are rolling with delight over the maggots of such tarnished reputations like coyotes happily permeating themselves with the essence of week-old road kill. 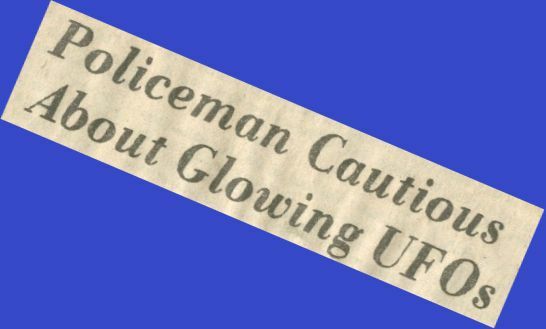 Yes, UFO evidence bears serious study, and some alleged abductions appear grounded in reality. But people such as Rolf Rahn are disturbing for other reasons. For instance, if one takes a poll at mental institutions we'll generally find that the "flying saucer" issue is rare among a population far more concerned with other torments. So, when we're confronted with the Rahns of the world who are obviously emotionally troubled, we have to wonder just where his personal alien, android and flying saucer demons originated. For the record, I'm sure that most people who injure or murder those close to them certainly do know who their victims are -- in fact, that's why they do what they do, because they're infuriated by precisely what they behold. What you see is what you get. . .or more to the point, what you see is what you get rid of. These days, many marriages and meaningless relationships seem to fit that bill, just check the news every day. An old tabloid headline once summed it up best: "Other people can make you sick!" But back to Rahn -- did he have some legitimate UFO experience that set him off, earlier in life -- or later? Of course, we'll never know. What do we know? We know that an android is defined as an automaton resembling a human being, and we know that an android is also described as a humanoid or a mechanical man. Putting medical textbooks aside, sometimes we simply have to wonder about the divisions between fantasy and reality. Mentally compromised people have enough trouble distinguishing between each, while the rest of us remain perhaps a bit too smug in the false belief that our bedrock bases of normalcy are secure. In the meantime, we believe that an android-obsessed farmer invited his own demise in 1991, and more recently a former medical student is about to rot in prison because he believed his wife an imposter. Don'cha kinda wonder if that person you sleep next to tonight or party with tomorrow evening might turn out to be your surprise executioner next week? Or you theirs? Whatever you do. . .don't be a stranger. Update on that collapsed Fenner, NY windmill (see previous entries): Looks like the experts still can't figure out why one windmill in the windmill farm simply toppled over. They now say there was no problem with either the materials or construction and the foundation was apparently sound. 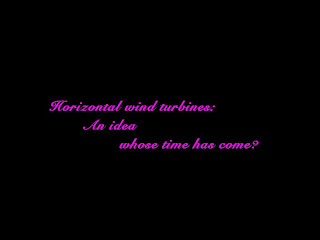 Even though the mystery remains so, officials are reactivating all wind turbines at the farm, having stopped them whilst investigating. I guess it was just one of those things, just one of those crazy things. . .which takes us nowhere, of course. If this were a medical issue in a hospital, medical intellectuals would say, well, we don't know EXACTLY what the diagnosis is, but. . .
UFOs of an apparently triangular shape are frequently described in reports of recent vintage, but the triangle is not new. In early October, 1975 an area 45 miles northeast of Cleveland, Ohio was reportedly the location where law enforcement personnel and others watched two triangles (according to UPI reports). Laws of coincidence apply here, as it turns out that the patrolman quoted is named Zachary Space. In any case, officer Space received a call between 3:30 and 4:00 a.m. to check out reports of a roughly triangular cluster of green and red lights. "I was looking for something out of 'Star Trek,'" quipped Space. "Off to the west, you could see this light, a red and green glow, moving very slowly. It appeared to stop and there was a brighter white glow. It stayed for a while and then started moving again. "I'd call it a triangle of lightning," Space explained. "The top point was one strong point of light. It would have to be awfully large to be seen when you're a mile or two away from it." Space soon met with witnesses who first called in the sighting to Madison Township, and they were joined by another police officer and a newspaper deliverer. 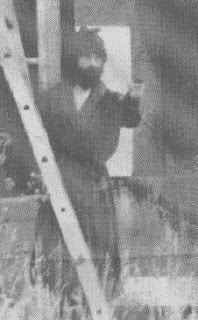 The group intently watched two triangles, one in the west and the other in the eastern sky. "There are high-tension wires going through town," Space continued, "and one hovered over the towers, about treetop level. That's when it glowed white. Then it started to rise and glowed red and green and it went up like a flash -- whoosh! -- like somebody blew a match out." The witnesses watched as the object ascended, disappeared and then returned. "We couldn't decide whether it was the same one or another one," said Space. "Then we heard more radio traffic. A Lake County sheriff's deputy saw something." Space retrieved a telescope ("not very powerful") from his patrol car and was able to view the object as a triangular shape. Of further interest, UPI noted that the village police car was equipped with an aircraft landing light, used as a spotlight, and "we shined it at the thing," Space noted. An observation of one triangular object can be strange enough -- but two? And just when you want to say, well, maybe they were experimental aircraft, we harken back to the high-tension wires. 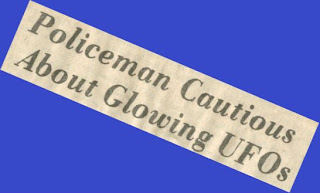 Particularly in the sixties and seventies, UFO manifestations near and just above power lines were not uncommon. Indeed, low-cruising objects often appeared to follow electrical lines, simultaneously aglow with changing colors, as if extracting power from or manipulating the lines in some way -- and because there are on file instances of power failures apparently coinciding with UFO/power line incidents -- it wouldn't be surprising if this Ohio event remained unexplained. Intoxicated into dependence upon the planet's oil reserves? Yes, and here we are, and rare is the man, woman or child who would willingly forfeit daily products of convenience brought into existence via petroleum's wonders. Look at us. We've finally done it, the big one. Easily accessible oil pockets are all but gone, so now we're into the really deep stuff. We blame British Petroleum -- heck, some simply blame the British, period -- and we blame the industry itself. Well, we're not all British, but we are all BP. We are all the industry. One way or another, we bathe in petroleum every day, and now a world of sea life and habitat is gone, many important aspects probably banished and petrol-euthanized forever. Who is responsible? "They" are. We are they. We are responsible. Who are we? We are the movers and shakers who make things happen. Even these things. Even this Thing of things. I'm sick to dearth -- yes, dearth -- of talk about alternative energy. It's on the horizon, it's right around the corner, it's here. Okay, so it's here, be it solar, wind, nuclear, water, geothermal or hydraulically-induced cat flatulence. So what? The world will still be gobbling oil up generations from now (assuming we survive our actions, which is always a poor bet). 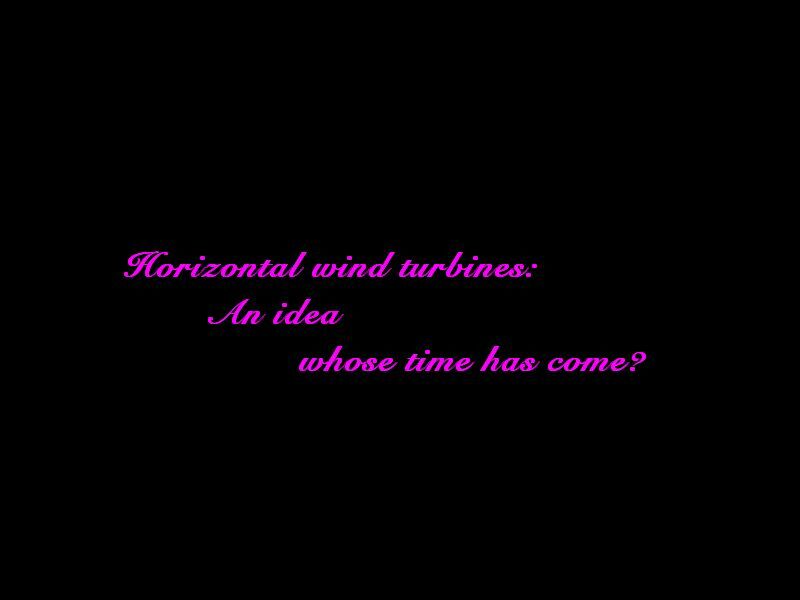 The current buzz, so reminiscent of decades past, is that we either have or need a BOLD NEW ENERGY POLICY. Is that what we want? Guess so. You know what I want? I want my government to come clean about UFOs with the American people. I want officials to 'fess up about what we know or don't know. Or just admit there's substance to thousands of reports squeezed out over the years with integrity by folks. Let's acknowledge that some kind of energy is associated with the "phenomenon." Confirm the mystery of the energy, assure the scientific community that the UFO is real and important, and encourage those of appropriate education, intellect or plain old common sense to get out there, consider well-witnessed UFO maneuvers seriously and determine the science-- and the energy forces behind this remarkable enigma. Maybe we'll learn a few things along the way. In the meantime, we just sit by and allow perhaps the best alternative possibilities to go unnoticed. Imagine all the brain power going to waste among scientists merely because nobody's stepping forth officially to alert a wealth of uninformed government or non-government personnel to concentrate their efforts on the UFO -- a legitimate issue whose hidden charms may benefit us in terms of energy alone. Assuming we haven't brought a UFO to the lab -- or assuming we have -- there remains a lot of known evidence out there, and all those years of meticulous documentation didn't arise out of obscure tales of wow. Meanwhile, the oil leaks. Too bad truth doesn't do the same. Seems there's a bit of discontent in Great Britain about an attempt to prevent alleged computer hacker Gary McKinnon from coming to the USA because of his Asperger's syndrome. Officials fear that if McKinnon's disorder can keep him on his own shores, then supposed Islamic terrorists hosted by the Brits and due to be extradited to the U.S. will also claim various illnesses to avoid the trip. Frankly, England, feel free to keep the terrorists. Should they come here, we'll just read 'em Miranda rights, luxuriously bathe them in legalities and, before we know what hit us, they'll be made citizens with voting rights. Besides, I understand you've already, for some inconceivable reason, allowed Sharia Law to influence and tarnish parts of your homeland, setting aside British law, and because I really don't want that rather neolithic form of Islamic rule trumping my country's cherished Constitution, I insist -- keep the terrorists and love them as if they were yours. And they are. But what about McKinnon, yes, what about McKinnon? Actually, I think we've more than enough trouble here currently, what with the worst environmental (oil) disaster in U.S. history occupying our efforts. The worse things get, there are fewer and fewer British Petroleum representatives with British accents speaking publicly here -- I suspect they're putting their native American spokesmen, who sound like the Marlboro Cigarette man, up front so's we won't think of England when we smell oil on our shoes, ankles or knees. In fact, after the CEO of BP made such a fool of himself with reckless comments, I should think that McKinnon's lawyer might ask that his client be kept in Great Britain strictly out of fear that Americans won't put up with his accent for a moment because of that CEO. I harbor no ill will toward the British at all --why would I? -- but you know how some people are. The extremely bad news for McKinnon would arise if U.S. officials decide that we badly require a national diversion, right here and right now, to take our minds off not only corporate foul-ups, but government incompetence as well -- and, hoo boy, do we have plenty of the latter on our shores. Pack your bags, Gary, and stand by, is my advice. Nice to be needed and wanted, what? Long, long ago I knew that the UFO was a legitimate scientific mystery -- not because I'm either brilliant or crazy, but simply because the evidence speaks for itself. Now, I, we, wait, we just wait. Israel and boarding that vessel: Hey, good for you, but next time just drop a bomb and sink the damned thing. The video clearly shows your people being attacked on a ship which, supposedly, was cruising along peacefully but was not. And were I you, I'd stock up on a few more nukes (which you never claim to have), too. A 13-story mosque is being built -- compassionately -- near the site of the World Trade Center, which Islamofascists non-compassionately destroyed with some 2,000 irrelevant people inside: Well, I don't mean to be rude, but when this new thingie is built and requires an address, maybe the Post Office could designate it as #1 Predator Drone Plaza? Impressive! The World Health Organization: Why are they considering taxing us to use the Internet, send e-mails and conduct financial transactions online? Who do they think they are? You had better call your member of Congress about this one, because they're looking for funds right out of our pockets. The FCC is screamin' to make the Internet equivalent to a public utility, after the Obama Administration was already defeated in attempts to put more government control on the Web and your freedoms. Beware. The Federal Trade Commission wants to get into the journalism business, even going so far as to "license" journalists? Oh, this is reallyyyyyyyyyy bad. Caution. Finally. . .the U.S. is sure itchin' to have Gary McKinnon as a dept. of prisons guest. 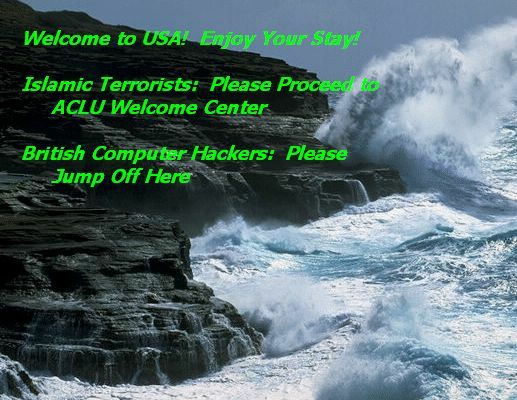 I wonder if he can avoid that dreaded voyage across the pond by reminding American officials that, even though he lives in England, his hacking activities are nothing compared to British Petroleum's cute incompetent antics, as aquatic life dies by the mega-score. Or shall we be bombing Great Britain shortly over this?